What had already been a good week for Chris Eubanks turned into a great week after the Georgia Tech rising junior upset world #104 Thiago Monteiro to qualify for the main draw at the BB&T ATP 250 Atlanta Open. 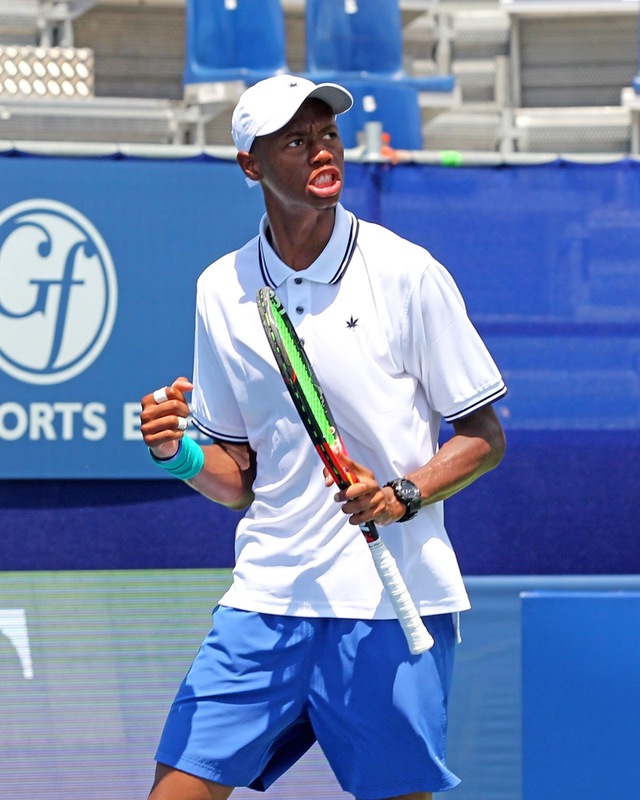 Eubanks had to earn a spot in the qualifying field by winning a Wild Card playoff over teammate Cole Fiegel and 2013 Samford graduate Zac Dunkle and then he had to beat world #210 Tommy Paul in the opening round of qualies just to get to today's match against Monteiro. Eubanks earned the only break of the first set when he broke Monteiro's 2-2 service game to go ahead 3-2 and three holds later he had the opening set 6-4. Eubanks broke Monteiro's 3-3 service game in the second set but Monteiro broke back to even it at 4-4. Eubanks fought off a set point to hold for 5-5 and then he broke from 30/40 to go up 6-5. Eubanks went up 40/15 on his serve and held from 40/30 to win it 6-4, 7-5. Eubanks entered the week with one career ATP point but by qualifying for the main draw he earns 12. Eubanks's opening round opponent will be determined after all the qualifying matches are concluded. #333 Tennys Sandgren (Tennessee '11) ran his winning streak to 10 after defeating #421 Marc Polmans 7-6(4), 1-6, 6-3 in the finals of the $25K USA F25 Futures in Edwardsville, Illinois. Sandgren opened up a 5-2 lead in the first set but Polmans won three straight, including a break from 15/40 of Sandgren 5-3 service game, to even it at 5-5. After a pair of holds Sandgren went ahead 5-1 in the tiebreak and took it 7-4. Polmans dominated the second set and took it 6-1 in just 26 minutes. Sandgren rebounded in the third and went ahead 2-0 but Polmans broke back and held for 2-2. Sandgren would regain the break advantage when he broke Polmans at love to go up 5-3 and then he held in a one-deuce game to close it out. It was Sandgren's 12th professional singles title (11 Futures/1 Challenger) and the second consecutive week that he won a Futures event in the St. Louis area. Jackson Withrow (Texas A&M '16) and Connor Smith (Ohio State '13) won the doubles title in Edwardsville with a 6-3, 6-2 win over Marc Polmans and Luke Bambridge. Withrow and Smith broke to go ahead 4-3 in the first set and then they broke again to take the set 6-3. Polmans and Bambridge jumped out to a 2-0 lead in the second set but Withrow and Smith won the next six games to close it out 6-2. It was Withrow's first pro title of any kind while it was Smith's ninth career doubles title. #963 Rishab Agarwal (Mississippi State Rising Sr) was attempting to win his first pro singles title but it wasn't to be as he fell 6-1, 6-2 to the top seed #439 Seong-Chen Hong at the $10K Vietnam F1 Futures in Thu Dau Mot City.